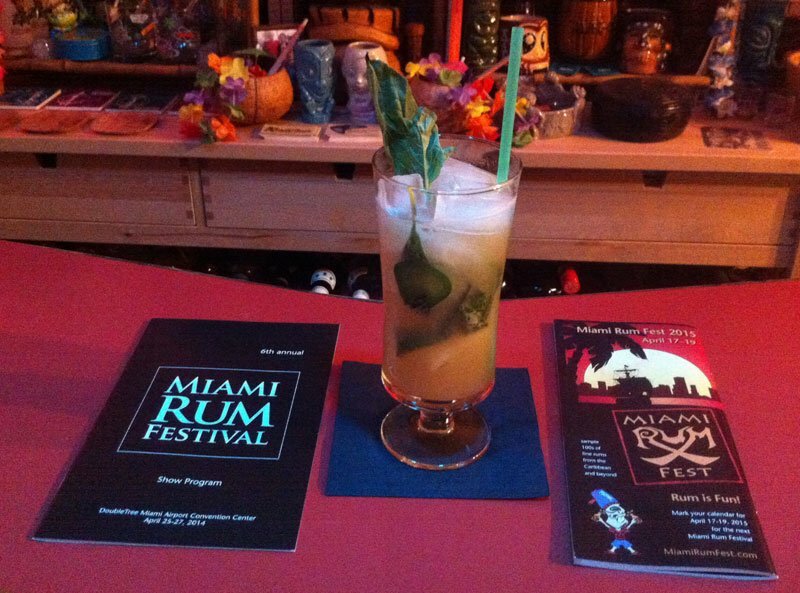 Fueled by the first Miami Cocktail Week, mixologists upped their game at the 2014 Miami Rum Renaissance Festival in April, presenting new and classic drinks with a modern flair. From the full week of events hosted by area bars, to the three-day Grand Tasting exhibits attended by more than 10,000 enthusiasts, there were plenty of opportunities to sample some of the best rum drinks being created today. This story covers my search for the tastiest and most creative cocktails of the entire week. Click here for an overview of the festival and reviews of the best rums. 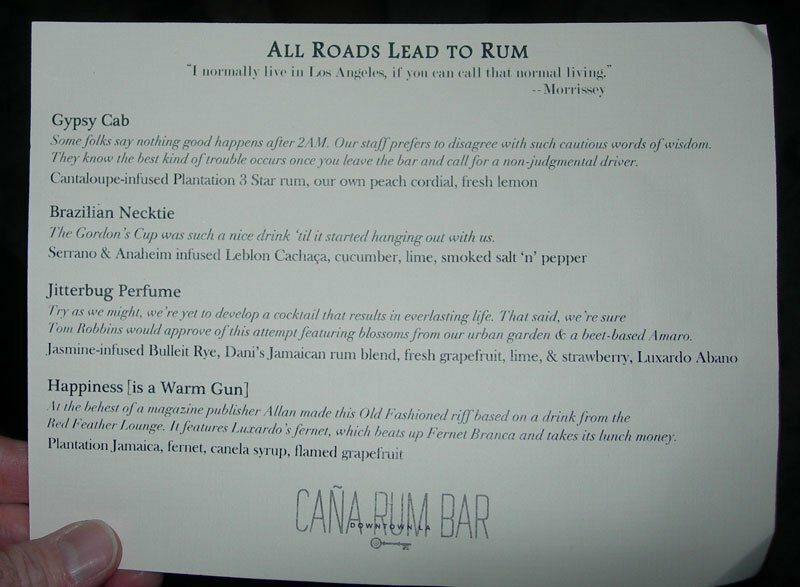 There were four complimentary drinks [see menu] expertly mixed by Daniele Crouch and Matt Robold, aka Rumdood. This was no easy task considering the temporary bar set up on the patio, not far from the pingpong table and quite a distance from any traditional bar fixtures and plumbing. But the drinks were spot-on, made to order and consummately garnished. This pair deserves an award for most impeccably produced drinks under strenuous circumstances. 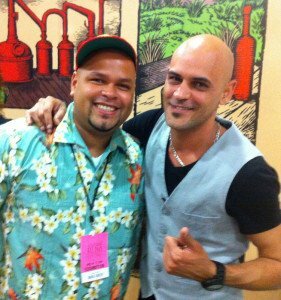 I noticed Rumdood sweating in the Miami heat, but he and Daniele never lost their cool. My only complaint would be that they ran out of their homemade peach cordial before I could try the Gypsy Cab cocktail, which got high marks from the folks I talked to. My favorite of the evening, and also ranking as one of the top drinks of the entire week, was Happiness [is a Warm Gun] [see photo]. 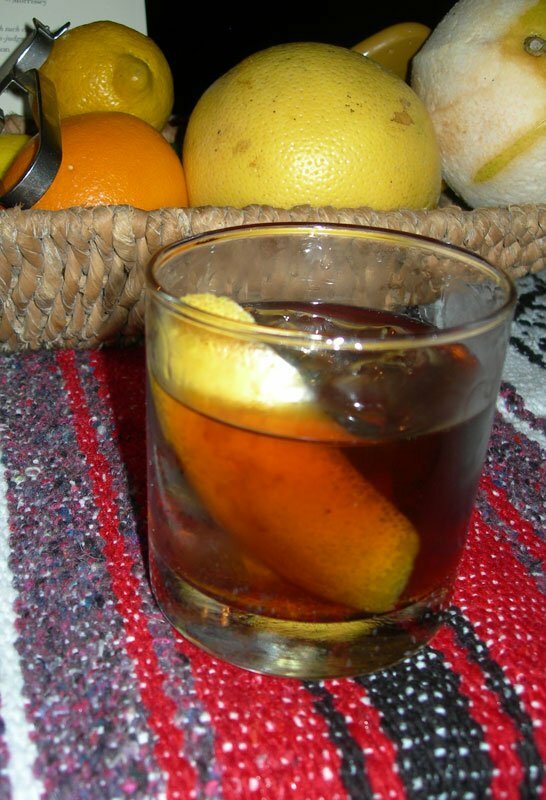 This riff on a rum Old Fashioned features Plantation Jamaican rum, Luxardo Fernet (a strong bitter amaro), canela (cinnamon) syrup, and a flamed grapefruit peel. The drink was perfectly balanced, not too overpowering (as some Old Fashioneds can be) with just the right touch of sweetness. And the Luxardo Fernet is extremely smooth (according to the menu, it “beats up Fernet Branca and takes away its lunch money”). 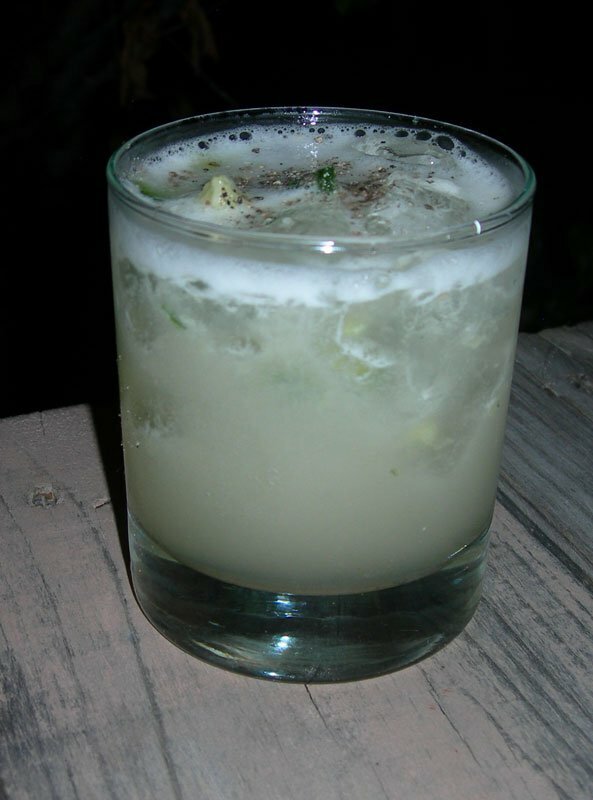 Click here for the recipe (published in the L.A. Times Magazine when the drink was called The Smoking Gun), and here for more Caña Rum Bar recipes. Rating: 8 out of 10. I also tried the Brazilian Necktie [see photo] (Leblon Cachaca infused with Serrano and Anaheim peppers, cucumber, lime, smoked salt ‘n’ pepper). This was the start of what would become an interesting trend for the week: Cocktails laden with vegetables. But the best was yet to come. This one fell a little short. It was spicy, but didn’t have the depth of flavor I was expecting. Rating: 7 out of 10. 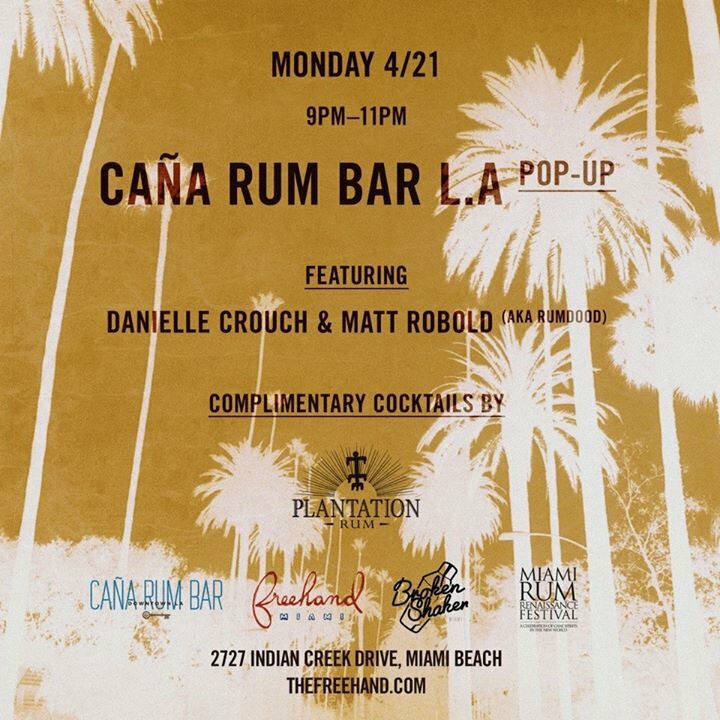 Monday’s event hammered home several facts I already knew: The Broken Shaker is a great venue for chilling out with craft cocktails, and Plantation rum is one of the best in the world for mixing. The addition of the fine drinks by the Caña crew was just icing on the cake. Caña specializes in simple yet creative craft cocktails, and this was the perfect way to start the week. On Tuesday, Rum Fest attendees went from elegant and simple to over-the-top Tiki at the venerable Mai-Kai in Fort Lauderdale. To be fair, I’m not including the cocktails from the regular bar menu in these ratings (both here and at The Broken Shaker), so I’ll concentrate on the special drink served Tuesday featuring Don Q rum. That’s not to say that many other Mai-Kai classics weren’t imbibed. They were (see photo above). I made it a point to get there early and finish up my research on a new Special Planters Punch recipe and review while staking out a spot at the soon-to-be-packed Molokai bar. I also had the pleasure of meeting several jet-setting rum experts from the U.K. – John Gibbons, and Peter and Pauline Holland from the Floating Rum Shack. 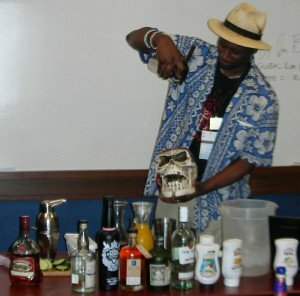 I was flattered that these International Rum Expert Panel members were referring to my guide in search of Mai-Kai cocktails to enjoy. Naturally, I offered up quite a few tips, and many of us skipped the dinner show and hunkered down in The Molokai for tropical drinks and pu-pu platters. I also chatted with Paul Senft of Got Rum? Magazine and the Rum Journey website. Rum judges are indeed an affable bunch. 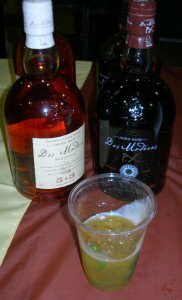 But my main order of business was to sample the night’s special drink, sponsored by Don Q Rum and created by The Mai-Kai. Featuring Don Q Añejo, the small sipper was sweet and complex, with a familiar flavor that I couldn’t quite put my finger on. 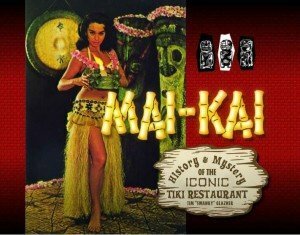 It wasn’t until later, when I referred to the list of retired Mai-Kai cocktails and conferred with manager Kern Mattei, that I found the answer. 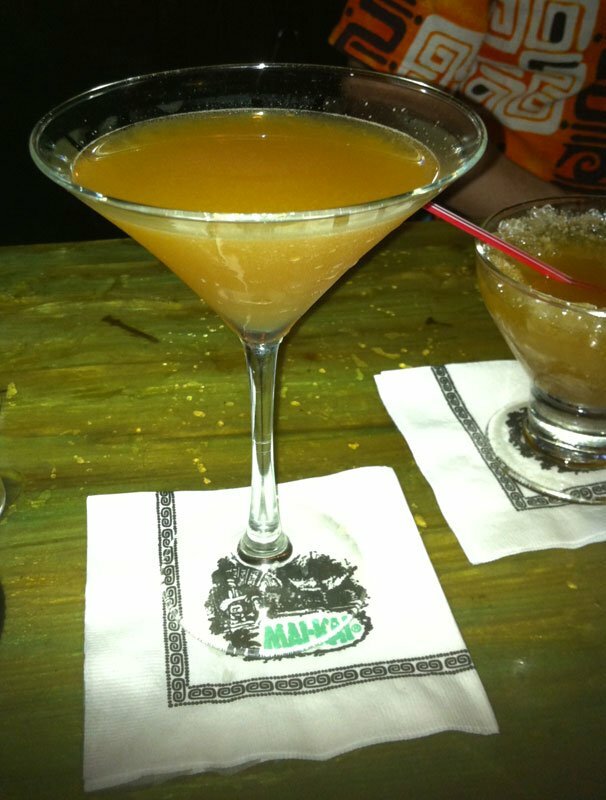 Simply called the Don Q Cocktail, this was actually a retooled version of the Liquid Gold, a Daiquiri-style drink that appeared on The Mai-Kai’s original 1956 menu but was retired decades ago. 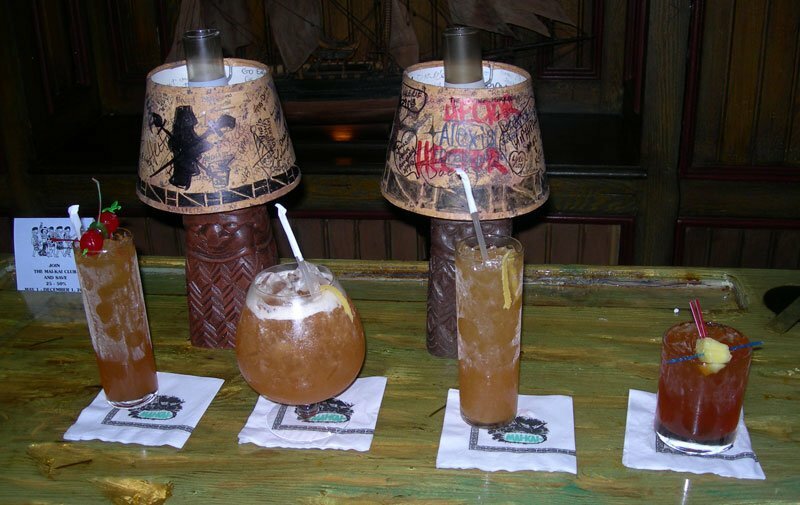 But it goes back further: The Liquid Gold was The Mai-Kai’s version of Beachcomber’s Gold, a Don the Beachcomber drink that dates back to the 1930s and was reportedly a favorite of actress Marlene Dietrich. 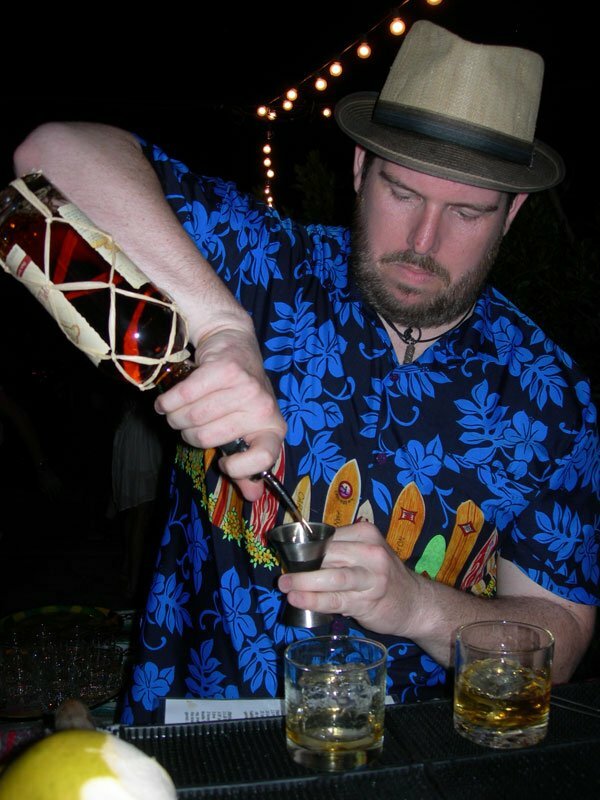 Most of the Rum Fest attendees were probably unaware of the cocktail’s historical significance. [Click here for the full story behind the drink] Regardless, a good time was had by all, and the Don Q Cocktail ranked as one of the week’s highlights. Rating: 7.5 out of 10. Pulse blend with 1 cup of crushed ice for 8-10 seconds and strain into a chilled cocktail or martini glass. Review and notes: This has great balance for a sweet drink, thanks to the Pernod and gold rum. On top of the rich sugar syrup, the amaretto adds a sweet almond flavor. The Liquid Gold may have at one time used orgeat syrup, while one version of Beachcomber’s Gold featured almond extract. Later in the week, a group of us had the rare treat to sample an authentic Liquid Gold, served at The Mai-Kai for the first time since perhaps the 1980s. Mattei brought it out of the vault for a handful of VIPs to sample, and not surprisingly it still holds up. Featuring multiple rums and a heavier dose of Pernod than the Don Q Cocktail, it packs a lot of flavor into a small package. Click here for a tribute recipe and photo. I took a little break from the festivities and skipped Wednesday’s party at the Bacardi penthouse, plus the Thursday/Friday extracurricular activities at Gramps Bar in Wynwood and The Corner in Miami, so it’s possible I missed some stellar cocktails there. Next year, when Miami Cocktail Week launches in earnest, more destinations will be on my agenda. As usual, it was hard to tear myself away from The Mai-Kai with so many VIPs in the house. Christie “Tiki Kiliki” White (The Hukilau), Otto von Stroheim (Tiki Oasis), and Tim “Swanky” Glazner (Swank Pad Productions) were all in the house Friday night. On Saturday night, Mattei marked the occasion by rolling out not only the aforementioned Liquid Gold, but also several other lost classics. 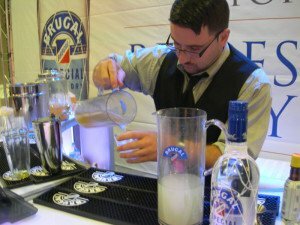 There were other after-hours events Saturday and Sunday in Miami, but I was focused on the big shindig, the real purpose of the event: The rum showcases, sample tastings, seminars and related activities at the Doubletree by Hilton Miami Airport Convention Center, aka the MACC. Friday was Trade Day, reserved for members of the spirits industry to network and get first shot at the tasting booths. On Saturday afternoon, it was time to get down to business, hit the MACC and sample some cocktails, along with many award-winning rums. Click here for an overview of the event and breakdown of my rum-tasting efforts. My plan was to target new and award-winning rum offerings, with a similar strategy for the drinks. I had a list of the RumXP award winners, but I had to rely on instinct and experience in choosing cocktails to taste. My goal was to find the best of the best, so I needed to include some old standbys. My first stop was the Papa’s Pilar booth and the Hemingway Daiquiri (Papa’s Pilar Blonde, lime juice, grapefruit juice, maraschino liqueur). As expected, it was very tart but also unexpectedly fresh and vibrant. 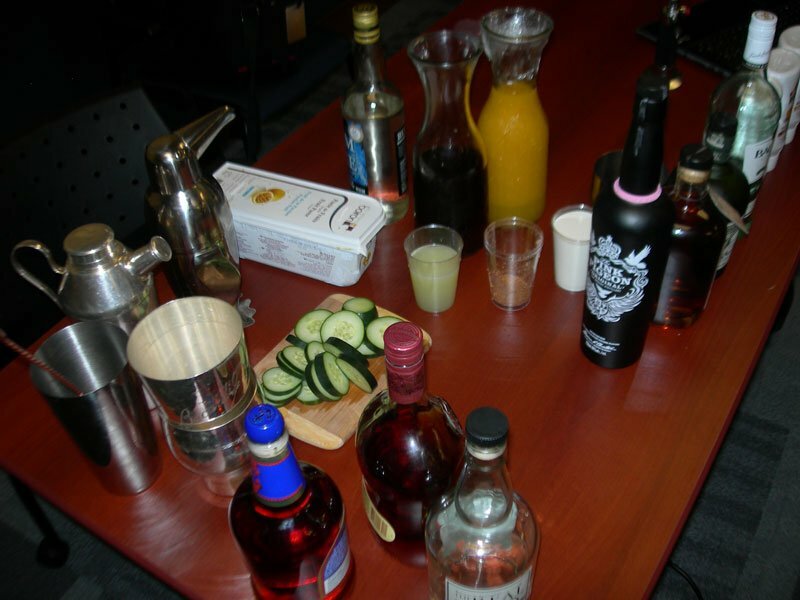 Drinks are typically made in batches for the hordes of festivalgoers, which can muddle some more complex cocktails. Not so here. Rating: 7 out of 10. To be fair, most of the cocktails were made fresh in very small batches, and some were even created individually on the fly. One of these, a tasty Mojito served in the Ron Abuelo booth, was nicely garnished and one of the best looking drinks at the Grand Tastings. It featured the award-winning Abuelo 7 from Panama, which won a gold medal for Aged Rum, 4-8 years. But at the end of the day, it was still just a Mojito. Rating: 6 out of 10. Cocktails in a festival environment can be hindered by the fact that the rum companies tend to use simple recipes that spotlight their products. You’ll find lots of Daiquiri and Mojito variations. Last year, I noticed a same-ness to the drink offerings, but I was pleasantly surprised this year with the variety and quality of the cocktails. Plantation Rum, which is acclaimed for its creative aging process and dominated the RumXP awards for the second year in a row, brought some creativity to its sample cocktail as well. The Plantation Rumba Daiquiri featured a special “Rumba Blend” containing 5 parts of its Original Dark rum, 4 parts 3 Stars white, and 1 part Grande Reserve 5-year-old. Two of those rums were among the impressive eight medal-winners on display. But the Daiquiri – containing 2 ounces of the rum, 1/2-ounce of lime juice and 1/4-ounce of simple syrup – was still a bit too one-dimensional to score highly. Rating: 5 out of 10. Brugal had a little more success with another old-school classic, the Bee’s Knees. Brugal’s Especial Extra Dry, a cask-aged luxury white rum, combined nicely with the sweet honey for a solid but unspectacular sip that was also a bit on the weak side. Rating: 6 out of 10. Packing a lot more firepower was the aptly named Fire Punch featuring the award-winning Rum Fire overproof rum. Produced at the Hampden Distillery in Jamaica, this stringent white rum has the same deliciously funky taste as the popular Wray & Nephew White Overproof Rum, only smoother. And perfect in a punch. Rating: 7 out of 10. Pusser’s was a welcome addition to the Miami Rum Festival this year, showing off not only its classic Navy rum but also a selection of three cocktails. I was expecting the Painkiller (Pusser’s Rum, pineapple juice, orange juice, cream of coconut) to be the standout, but was pleasantly surprised by the Grog (Pusser’s Rum, dark cane sugar, lime). Perhaps they were using the award-winning 15-year-old rum (Best in Class for Aged Rum, 13-18 years) in the Grog that day, but it was nevertheless outstanding, spicy and full of flavor. Ratings (with links to the recipes): Painkiller (7 out of 10) and Grog (8 out of 10). 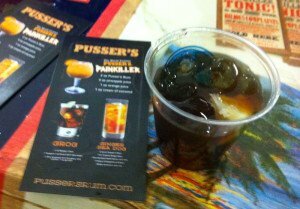 Also, extra points to Pusser’s for providing a third cocktail (Ginger Sea Dog) and creating one of the most elaborate and inviting booths of the festival. Though I wasn’t lucky enough to be one of the judges, from what I hear perhaps the best cocktails of the event were concocted by the Bacardi U.S. Tiki Team, which emerged victorious in its clash with the U.K. team, the defending champs in the fun-filled World Tiki Team Championship. This included a take on the classic Yellow Bird, featuring Plantation and Appleton rums and served in a large cat vessel (named Cat in the Jungle); and a smoked Old Fashioned that they improvised using charred wood planks. [Click here for more coverage] It will be interesting to see if these guys return next year to defend their title as the top Tiki bartenders. I have a feeling the U.K. team will come back with its guns blazing. It could be a great rematch. The Goslings booth offered several cocktail options. 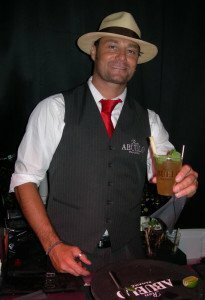 Looking for an alternative to the ubiquitous Dark ‘n’ Stormy, I spotted the Bermuda Rum Swizzle, one of the few cocktails at the tasting booths containing multiple rums. Featuring Gosling’s Black Seal and Gosling’s Bermuda Gold, plus orange juice, pineapple juice, grenadine, and Angostura bitters, this was a good example of a punch-style drink [see recipe]. It was well-balanced and went down smoothly, but it still had that distinctive Black Seal flavor. Rating: 7 out of 10. Swizzle with ice; add more ice and garnish with a lime wheel and a mint sprig in a highball glass. Review and notes: There are many sweet and tart fruits and savory ingredients in this drink, yet it still tasted very well balanced and let the rich 86-proof, small-batch rum shine. This cocktail immediately became my favorite, and I returned for several more. It didn’t hurt that it became even better when I added a bit of 1703 or Navy rum to the mix. Rating: 8 out of 10. Ingredient tips: Boiron is a premium producer of frozen purees based in France. They’re a longtime AlambiQ client, and the products turn up in many of the firm’s cocktails. 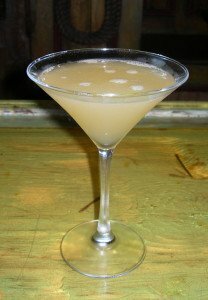 They’re excellent ingredients and quite difficult to duplicate, so I’d recommend seeking them out if you’re interested in making high-end cocktails. They’re available online via Amazon and at select retailers. I don’t have all of the above products, so I have yet to attempt this drink at home, but I may try it with crushed fresh pineapple, ginger syrup and fresh-squeezed lemon juice. Go light on the peppercorns. The spice should just be a slight hint in the background. You can make your own honey syrup by mixing equal parts of honey and water. It should stay in a liquid state in the fridge. Heading into Sunday’s finale, I had many outstanding drinks at the top of my ratings but nothing that stood head and shoulders above the rest. I knew that an upcoming seminar may reveal a contender, but I wasn’t expecting to find one at the humble Dos Maderas booth. There were just two rums for tasting (5+3 and PX 5+5) and one cocktail, but the drink was a doozy. I knew the rums had a special pedigree, an innovative two-step aging process that creates a sweet, rich and smooth taste. It begins in Barbados and Guyana, then the rum is shipped to Spain for final aging and blending. Matching the rum in uniqueness was the Passion Fontaine, an intensely flavored punch featuring the 5+3 rum, passion fruit, lime, jalapeño and basil. You read that right. When I saw the peppers and fresh herbs floating in the punch bowl, I did a double-take. But the drink works beyond all expectations. Shake with ice. Strain over fresh ice and garnish with fresh basil and jalapeño in a rocks glass. Review and notes: This is a seemingly simple cocktail, but all the intense flavors mesh in surprising harmony. When you raise the glass, you get the nose of passion fruit and basil, then upon sipping you’re hit with the tartness of the lime, the heat of the jalapeño, and the rich sweetness and punch of the rum. Rating: 9 out of 10. Ingredient tips: Dos Maderas 5+3 is certainly a unique rum by nature of its aging process, and it does work very well in this cocktail. But you could do just as well with a smooth, aged mixing rum from Barbados such as Plantation 5 or Doorly’s X.O. Lacking Dos Maderas 5+3, I went one step further and combined the Barbados rum with Demerara rum (El Dorado 8 works great). The result hits the same notes as the original drink by including both countries of origin, and it adds a bit of complexity to the cocktail. As good as the rum is, this drink would be nothing without the interplay of the jalapeño and basil. Be sure to garnish with plenty of basil to add fresh aromatics. When dealing with the jalapeño, be sure to remove the seeds and white fascia. See my notes above about Boiron in the Miami Swizzle cocktail. If you don’t have access to these purees, this drink is a bit easier to reproduce. I simply used fresh lime juice, and passion fruit syrup in place of the passion and simple syrup combination. I make my own rich syrup using a more economical frozen passion fruit pulp from the grocery store and heating it with an equal amount of rich sugar syrup (2 parts sugar to 1 part water). Fresh is best, but a good bottled syrup by Fee Brothers or B.G. Reynolds will also serve you well. Another good source of gourmet passion fruit products is Aunty Lilikoi from Hawaii. The seminar by the always popular “rum ambassador,” Ian Burrell, was scheduled for the end of the day and would likely decide my ultimate winner among all the week’s cocktails. Burrell’s topic, “The Wonderful NEW World of Tiki Cocktails: 10 Reasons Why It’s Here to Stay,” included several of his signature drinks along with lots of fun facts and “edutainment” that we’ve come to expect from rum’s international spokesman. Creamy style drinks are one of Burrell’s specialties, and Tou-Can Play That Game was a great example. It was smooth, rich and creamy with exotic spices balancing the sweetness. It features Coco Real and Pumpkin Real, milk cream, lime juice, and three excellent rums: Real McCoy 3 White, Diplomatico Reserva Exclusiva, and Rum Fire overproof. Dusted with nutmeg, it makes for a great alternative to the Piña Colada. Rating: 6.5 out of 10. Finally, Burrell pulled out all the stops with one of the most unique cocktails I’ve tasted in quite a while. I had already spotted the sliced cucumber on his work station (see photo above), so I knew something creative was coming. The only question was: Would it be good enough to top the Passion Fontaine as the best drink of the festival? The answer: Almost. The name Good Head, chosen by an audience member, just doesn’t do this drink justice. Its giant skull mug is responsible for that. Despite the 3 ounces of rum, it’s deceivingly light and refreshing. Full of exotic flavors and flamboyantly presented, it was a Tiki-style drink but with a craft cocktail sensibility. Ultimately, it was just a matter of personal preference. Mrs. Hurricane and I were both bowled over more by the spicy jalapeño than the cool cucumber, but it could easily have gone the other way. Rating: 8.5 out of 10. Shake the cucumber, apple juice, agave nectar and lime juice vigorously with ice cubes to break up the cucumber. Strain through a wire mesh strainer into a blender, add the rums and one cup of crushed ice. Pulse blend for 3-5 seconds and pour into a skull or Tiki mug. Add more crushed ice if necessary. Note that at the seminar, Burrell used a shaker instead of a blender for the final step, so that’s perfectly acceptable. But a quick blend will probably give the drink a better consistency and integration of flavors. Review and notes: Before even tasting, you get a strong whiff of cucumber. As Burrell pointed out, the vegetable combines with the lime, apple and agave to create a totally new flavor. The cucumber dominates, but you still get hints of apple and lime. The Pusser’s is used minimally, but still adds that distinct Navy rum flavor. And the Appleton also shines through as a solid base rum. Perhaps taking a cue from the popular Maid in Cuba cocktail (which features Bacardi white rum, cucumber, mint and lime), Burrell has upped the ante with this creative creation. There are plenty of classic recipes on this list, but also lots of fresh ideas and new twists. The high-profile use of jalapeño and cucumber in the top two drinks is a refreshing trend. These vegetables have been a staple in tequila drinks, but it’s clear that rum cocktails offer just as many, if not more, ways to experiment and craft new recipes. If you consider all the possible combinations of spices, fruits and vegetables with the massive spectrum of rums, the sky’s the limit. And that’s what makes rum so much fun to mix with. RELATED: Click here for The Atomic Grog’s full coverage of the Miami Rum Festival, including a photo gallery and list of all the award-winning rums. This entry was posted in Cocktail reviews, Cocktails, Cocktails, Events, Events, Mai-Kai, Recipes, Rum, Rum festivals, South Florida and tagged 151 rum, Appleton, Barbados rum, Beachbum Berry, Broken Shaker, Brugal rum, cocktails, dark rum, Demerara rum, El Dorado rum, Freddy Diaz, Ian Burrell, Jamaican rum, Mai-Kai, Miami Rum Festival Cocktail Week, Miami Rum Renaissance Festival, Molokai bar, Mount Gay rum, Navy rum, Plantation Rum, Pusser's rum, recipe, Ron Abuelo rum, rum, RumXP. Bookmark the permalink.